Foil_Lined_Square_Envelopes is rated 5.0 out of 5 by 1. What paper is the envelope made from so I can make sure the card matches? To find detailed attributes about certain envelopes, select a size and color, then the &quot;product attributes tab.&quot; There you will see the type of closure, finish, and weight for the product. At first glance, these white square envelopes might not make a statement. But take one look at the lining, and you’ll fall head over heels for it! The metallic foil will make all of your invites pop even before your soon-to-be guests read what’s on the card. Most popular for weddings and the holiday season, these envelopes will surely surprise your recipients. They’ll think it’s that regular mail, maybe even a bill (but hopefully not), until they open the sleek, square flap. The shine will reveal the happiness and joy you’re looking to present. Make your invites extra special this year with our Foil Lined Square Envelopes. 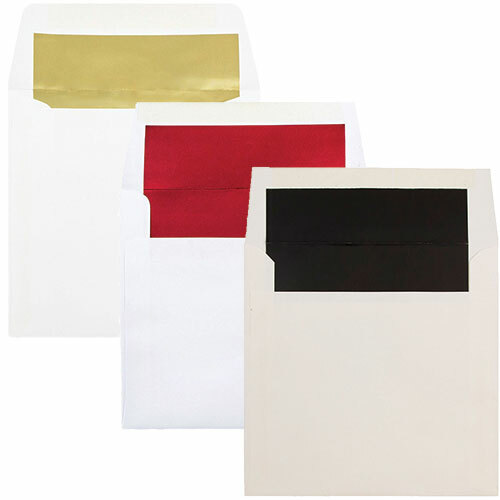 These envelopes are available in four sizes and multiple colors, including gold, silver, red, and blue. Make your holiday more festive with our red lining or add some blue to your wedding invite with our blue lining! Either way, these envelopes are sure to impress everyone, from the boldest to the oldest!